The holidays can be an exciting time—full of gatherings of friends and family, beautiful lights, delicious food, gifts and more. It can also be stressful with many demands on your time, money and physical and emotional energy. Here are the top suggestions from WHA’s behavioral health team for maintaining your health when faced with holiday stress. It can be easy to skimp on shut-eye when you need to get the baking done, gifts wrapped, cards written and last-minute errands run. However, less sleep will leave you less productive and more stressed and irritable. If that isn’t enough motivation to hit the sack at a reasonable hour, remember that lack of sleep is associated with higher levels of the stress hormone cortisol, which increases your appetite and can lead to weight gain. 2. Pay attention to alcohol intake. Many social events crammed into a short period of time—a.k.a., the holidays—can be associated with binge drinking. For women, binge drinking is defined as drinking four or more drinks on the same occasion at least one day in the past 30 days. Binge drinking is associated with some not-so-festive outcomes, including: poor sleep, impaired cognitive function (even after the alcohol has cleared your system), depression, anxiety, motor vehicle accidents and overall reduced quality of life. Gift limits, time limits, money limits, food limits—set all the limits you need to feel comfortable. Uncle Eddie get loud after dinner? Excuse yourself for a walk! Big family? Agree on a gift theme or quantity/dollar limit. Or pick names for adult gift giving so you don’t have to run yourself ragged (and broke) finding the perfect something for everyone. Too many party/gathering invitations? Decide on a reasonable number for a typical week or weekend and once you hit that number start saying no. It feels better than you think! Grandma always trying to get you to eat one more slice of pie? Practice saying no prior to the family gathering or choose an ally who agrees to set limits with you. 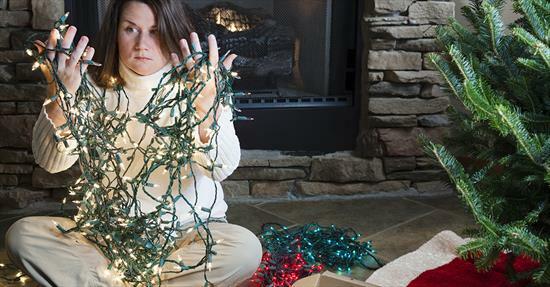 Examine your holiday expectations with the assistance of a behaviorist—most disappointments happen during the holidays because of unfulfilling past holiday experiences or unrealistic expectations, which can increase stress and lead to breaking already established good habits. All of the demands on your time and energy will feel more manageable if you can work in some daily physical activity. If you can’t fit in a 30-60 minute workout, try for three 10-minute walk breaks spread throughout the day. Above all else, try to keep this time in perspective. Remember that things do not have to be perfect to be fun, memorable or meaningful. In fact, things NOT going as planned or hoped is often what creates lasting family memories! If you believe stress or life circumstances around the holidays—or anytime—are preventing you from maintaining your health, ask your WHA provider for a referral to one of our behavioral health specialists.